We match over 1,100 pro bono attorneys with cases each year across a wide range of legal matters including immigration, bankruptcy, end of life planning, veterans disability, homelessness, and micro-entrepreneurship. The City Bar Justice Center offers a range of pro bono opportunities for firms and corporate legal departments, from accredited trainings at your offices for your convenience to memorable Days of Service at the historic City Bar building in Midtown Manhattan. Our eleven core projects work to meet the needs of NYC’s low-income community across a wide variety of issues: immigration, homelessness, bankruptcy, LGBT advocacy, microbusiness, veterans assistance, and more. Law firms and corporations that provide financial support to CBJC receive priority for pro bono partnerships. By choosing to do pro bono with CBJC, you are giving your team the opportunity to grow professionally and personally by using their legal skills in a matter that may be outside of their practice area. We also design projects that tap lawyers with transactional skills. Pro bono work changes lives – clients and volunteer attorneys alike – and CBJC’s devoted staff provide training, mentorship, and support so that your attorneys can focus on securing the best outcomes for their clients. The CLE credit will be in the area of “skills” as defined by 22 NYCRR 1500.2. Attorneys may use these “skills” credits in their current reporting cycle or may use these credits as carry-over credits into the next biennial reporting cycle. The maximum number of carry-over credits, regardless of source, is six (6). Newly admitted attorneys may earn CLE credit for pro bono work “solely for the purpose of carrying over pro bono CLE credit to the following biennial reporting cycle in partial fulfillment of the requirements for experienced attorneys.” A maximum of six (6) CLE credits, including pro bono CLE credit, may be carried over to the following biennial reporting year. Newly admitted attorneys may not apply pro bono CLE credit to meet their minimum CLE requirements as set forth in 22 NYCRR 1500.12(a). Keep time records of their participation and retain those time records for a period of four (4) years. Complete the Affirmation of Pro Bono Services provided by CBJC, describing the services provided and stating the number of hours of pro bono legal service performed. The affirmation must be submitted to CBJC. Once we receive your affirmation form, we will provide you with a Letter of Participation. The Letter will include the date(s) of your assignment, the name of the pro bono CLE program, your name, the number of hours of pro bono service you provided and the number of pro bono CLE credit hours earned. The Letter of Participation is your proof that you have earned the CLE pro bono credits and you should keep it with the time records of your participation for the requisite period of four (4) years. Visit probono.net for helpful resources and a pro bono trainings calendar to assist in your representation of low income or disadvantaged clients. The City Bar Justice Center is a co-host of Pro Bono Net’s NYC Pro Bono Center. – Mei Lin Kwan-Gett, Deputy General Counsel and Head of Global Litigation, Citigroup, Inc.
– David Levine, General Counsel, Bloomberg L.P. 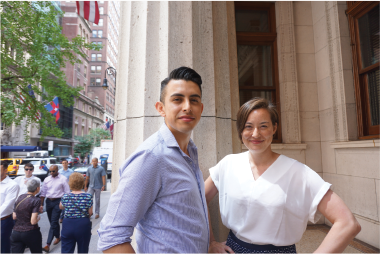 While CBJC is affiliated with the New York City Bar Association, CBJC depends on outside support of our pro bono partners and friends to sustain our services and expand our ability to provide access to justice for low-income New Yorkers. Our annual donors are given priority for pro bono work, legal clinics and trainings. Law firms and corporate legal departments can become annual donors through contributing to our Law Firm and Corporate Appeal in the fall and to our Annual Gala in the spring. To discuss your law firm or corporate legal department’s involvement with CBJC, please contact Kurt M. Denk, Pro Bono Counsel, at 212.382.4714 or kdenk@nycbar.org. Are you an individual attorney interested in doing pro bono with CBJC? Please visit this page.